What makes a pizza? Dough, cheese, sauce and maybe some toppings. What makes an UpperCrust pizza? Handmade dough and homemade sauce – prepared each day in our kitchen, freshly shredded 100 percent real milk cheese, and the right balance of spices all expertly baked. A crisp crust, a blend of melted flavors – an UpperCrust Pizza. 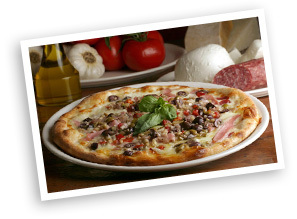 Add our tempting toppings or try one of our specialty pies to make our UpperCrust your own. We bring the same commitment to quality and taste to our appetizers, salads, pastas and sandwiches – from a traditional parmigiana to our grilled eggplant siciliana special. Want something more substantial? - you can create some dimaio cucina magic at your own house. We’ll help you customize a menu of half trays and full trays that’s sure to make every guest happy. Choose from salads, appetizers, pastas, sides and more.